Photo 1 shows the process of how to prepare the Hoi Muk Fai or Green Snaill shells for the inlaid work. The surface of the shell will be polished by a machine to remove all calcium and sand. 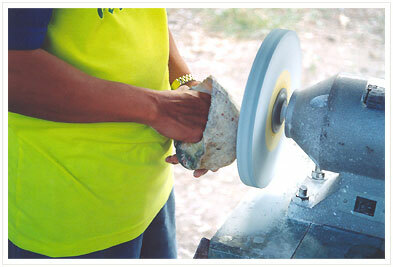 To prepare the shells for any mother-of-pearl inlaid work, Thai artisans use 2 types of shells. The first type is Green Snail, called in Thai Hoi Muk Fai or flame mother-of-pearl. Green Snail provides the best type of mother-of-pearl for the inlaid work. When this type of shell receives light, it will reflect in rainbow colours. The second type of shell is the Black-lipped Pearl Oyster which is called in Thai Hoi Muk Jarn. With its flat shape like a disk, this type of shell can be cut into straight lines for making the frames of the inlaid work.